North Carolina, one of the original states of the American Union, situated between lat. 33° 53' and 36° 33' N., and Ion. 75° 25' and 84° 30' W.; extreme length 490 m. from E. to W., extreme breadth 185 m. from N. to S.; area, 50,704 sq. m. It is bounded N. by Virginia, on the line of 36° 33;, E. and S. E. by the Atlantic ocean, S. by South Carolina and Georgia, and W. by Tennessee. It is divided into 94 counties, as follows: Alamance, Alexander, Alleghany, Anson, Ashe, Beaufort, Bertie, Bladen, Brunswick, Buncombe, Burke, Cabarrus, Caldwell, Camden, Carteret, Caswell, Catawba, Chatham, Cherokee, Chowan, Clay, Cleaveland, Columbus, Craven, Cumberland, Currituck, Dare, Davidson, Davie, Duplin, Edgecombe, Forsyth, Franklin, Gaston, Gates, Graham, Granville, Greene, Guilford, Halifax, Harnett, Haywood, Henderson, Hertford, Hyde, Iredell, Jackson, Johnston, Jones, Lenoir, Lincoln, McDowell, Macon, Madison, Martin, Mecklenburg, Mitchell, Montgomery, Moore, Nash, New Hanover, Northampton, Onslow, Orange, Pamlico, Pasquotank, Pender, Perquimans. Person, Pitt, Polk, Randolph, Richmond, Robeson, Rockingham, Rowan, Rutherford, Sampson. Stanley, Stokes, Surry, Swain, Transylvania, Tyrrel, Union, Wake, Warren, Washington, Watauga, Wayne, Wilkes, Wilson, Yadkin, and Yancey. North Carolina has no very populous towns. 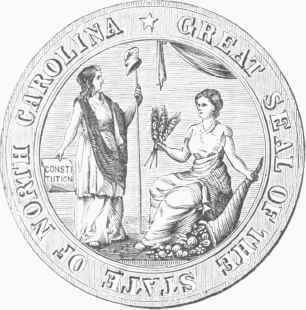 State Seal of North Carolina. Included in the population of 1800 were 1,158 Indians, of the total population in 1870, 518,-704 were males and 552, 657 females; 1,068,-332 were of native and 3,029 of foreign birth; and there were 1,241 Indians. Of the natives, 1,028,678 were born in the state, 15,425 in Virginia and Wesl Virginia, 13,537 in South Carolina, 3,505 in Tennessee, 2,052 in Georgia, 786 in New York, and 074 in Pennsylvania; and 307,362 persons born in the state were living in other parts of the Union. Of the foreigners, 904 were born in Germany, 677 in Ireland, 490 in England, and 420 in Scotland. The density of population was 21.13 to a square mile. There were 205,970 families, with an average of 5.20 persons to each, and 202,504 dwellings, with an average of 5.29 to each. The increase of population from 1860 to 1870 was 7.93 per cent. There were 182,421 persons from 5 to 18 years of age, 94,238 males from 18 to 45, and 75,274 male citizens 21 years old and upward. There were 339,789 persons 10 years old and over who could not read, and 396,993 unable to write; of the latter, 191,961 were white and 205,032 colored, 195,692 males and 201,301 females; 174,834 were 21 years old and over, and 222,159 were from 10 to 21 years. In 1874 there were 92,043 white and 48,277 colored polls. The number of paupers supported during the year ending June 1, 1870, was 1,706, at a cost of $136,470. Of the number (1,652) receiving support at that date, 1,124 were white and 528 colored. The number of persons convicted of crime during the year was 1,311. Of the number (468) in prison June 1, 1870, 138 were white and 330 colored. The state contained 835 blind, 619 deaf and dumb, 779 insane, and 976 idiotic. Of the total population 10 years old and over (769,629), there were engaged in all occupations 351,299; in agriculture, 269,238, including 168,978 laborers, 98,290 farmers and planters, 336 turpentine farmers, and 1,332 turpentine laborers; in professional and personal services, 51,290, of whom 861 were clergymen, 26,659 domestic servants, 16,830 laborers not specified, 574 lawyers, 1,143 physicians and surgeons, and 1,798 traders not specified; in trade and transportation, 10,179; and in manufactures and mechanical and mining industries, 20,592. The total number of deaths from all causes was 10,588, being 0.98 per cent, of the entire population; from consumption 1,236, there being 8.6 deaths from all causes to one from this disease. There were 741 deaths from pneumonia, 436 from intermittent and remittent fevers, 862 from enteric fever, and 418 from diarrhoea. - The state may be physically divided into the coast and swamp land section, extending from 80 to 100 m. inland; the middle section, extending to the foot of the mountains; and the mountain section, embracing the W. part of the state. The first section abounds in valuable timber, and includes the turpentine region. The country is level, with many swamps and marshes; the streams are sluggish and muddy. Much of the land is sandy, but a large portion of this region is very fertile, the swamps being generally so. Rice, cotton, tobacco, and maize flourish. The Great Dismal swamp extends N. from Albemarle sound into Virginia, covering an area of about 150,000 acres. (See Bog, and Dismal Swamp.) Between Albemarle and Pamlico sounds is Alligator or Little Dismal swamp, which is about as large as the other. It is estimated that the swamps of the state altogether cover 3,000,000 acres. Parts of the Little Dismal swamp have been drained so as to make valuable rice and grain lands; and a considerable quantity of the swamp land may be drained or reclaimed by embankment. The middle section is adapted to the production of the cereals, tobacco, and cotton. It possesses great mineral wealth, and abounds in streams affording extensive water power. About 100 m. from the coast the land begins to rise into small hills, and a little further westward is every variety of hills and dales consistent with a fertile country fit for cultivation. West of the Yadkin and Catawba rivers is an elevated region from 1,000 to 2,000 ft. above the sea; and still beyond this plateau the main range of the Appalachian mountains traverses the state from N. E. to S. W., reaching here its greatest altitude. (See Appalachian Mountains, and Black Mountains.) The Iron or Smoky mountains separate the state from Tennessee. Between these two ridges is a plateau whose altitude ranges from 3,500 to 4,000 ft., being the highest plateau of the same extent east of the Rocky mountains. In the centre stands the symmetrical forest-crowned summit of the Sugar mountain (5,312 ft.), and on its margin rises the Grandfather, 5,897 ft., the highest summit of the Blue Ridge, though inferior in altitude to the peaks of the Black mountains. The mountain region presents much beautiful scenery, and affords rich grazing lands and abundant water power. The coast line, beginning at Little River inlet, on the borders of South Carolina, runs nearly E. to Cape Fear, thence N. E. to Cape Lookout, thence in the same general direction to Cape Hatteras, and thence N. to the Virginia line, a distance in all of nearly 400 m. Cape Lookout is about midway between Cape Fear and Cape Hatteras. Two open bays, Onslow and Raleigh, are formed by these capes. Along the whole length of the coast are sandy, barren desert islands, from 9 to 2 m. wide, separated by numerous inlets, few of which are navigable. From these islands shoals extend far into the sea, which render the navigation of this coast exceedingly dangerous. Cape Hatteras forms the headland of the dangerous triangular island beach which separates Pamlico sound from the ocean. Narrow, shallow lagoons, filled with constantly changing sand bars, extend all along the coast S. of Cape Lookout between the mainland and the sand islands. In the N. E. part of the state, above Cape Lookout, are two extensive sounds, Pamlico and Albemarle, and a smaller one, Currituck, which are cut off from the ocean by the islands or sand banks before referred to. Pamlico sound, which is the most southern, extends from S. W. to N. E. about 80 m., and is from 10 to 30 m. wide, with a depth of 20 ft., and terminates westwardly in the wide bays of the Neuse and Pamlico rivers. There are several shoals within this sound. On the north it connects with Albemarle and Currituck sounds, and on the southeast with Raleigh bay by Ocracoke inlet, the only navigable inlet N. of Cape Lookout. Albemarle sound, which is 60 m. long and from 4 to 15 broad, extends W. into the mainland, and is not connected with the ocean except through Pamlico sound. Its waters are nearly fresh and not affected by the tides. Currituck sound extends N. from the mouth of Albemarle 50 m., passing beyond the limits of North Carolina. It is from 2 to 10 m. wide, and runs parallel with the coast, from which it is cut off, like Pamlico, by narrow sand islands. It connects with the ocean only through Pamlico sound. There arc spacious harbors at Edenton, New Berne, Beaufort, and Wilmington. - The rivers of North Carolina are numerous, but have shifting sand bars at their mouths, and rapids in their descent from the hilly regions. Cape Fear river is formed by the junction of the Haw and Deep rivers, which rise in the N. part of the state, and unite in the S. E. corner of Chatham co. The Cape Fear follows a zigzag course, the general direction being E. S. E., for about 300 m., including one of the head branches, and empties into the Atlantic near Cape Fear. It is navigable for vessels drawing 12 ft. of water to. Wilmington, 34 m., and for sloops and small boats to Fayetteville, 120 m. The Roanoke has its source in the S. part of Virginia, where it is formed by the confluence of the Dan and Staunton rivers, passes into North Carolina in Warren co., and, taking a serpentine course with a general S. E. direction, empties into Albemarle sound. It is 25Q m. long, navigable for small sea vessels for 30 m. and for steamboats 120 m. to Halifax. By means of a canal round the falls, very small boats are able to ascend to the Dan and Staunton. The Neuse river rises in the N. part of the state, takes a circuitous course in a general S. E. direction, and empties into Pamlico sound. Beginning a short distance above New Berne, it gradually spreads out into a lagoon. It is navigable for boats to Waynesborough, 120 m. from the sound. The far river also rises in the N. part of the state, between the Neuse and Roanoke, and, after a course generally similar to those rivers, with Tranter's creek forms at Washington an estuary called Pamlico river, and is navigable for steamboats to Tarborongh, nearly 100 m., including the estuary. The Chowan rises in Virginia, flows a little E. of S., and empties into Albemarle sound. It is navigable for 75 m. Among the other rivers worthy of mention are the Yadkin and Catawba, which rise in the W. part of the state, run S., and reach the Atlantic through South Carolina, the former as the Great Pedee, and the latter through the Santee river. From the W. slope of the Blue Ridge flow New river, the Little Tennessee, and several other streams, the waters of which, breaking through the Iron or Smoky mountains, join those of the Ohio and Mississippi. - North Carolina is geologically divided into three nearly parallel belts or zones. The first or eastern comprises the level sandy country along the coast, and extends back to the falls of Roanoke at Weldon, and to the first or lowest falls of all the other rivers. The midland zone is hounded W. by the line which skirts the outliers of the Blue Ridge. The third comprehends the western and mountainous part of the state. The systems of rocks are primary, and belong to the most ancient of the geological series, called azoic, metamorphic, etc. They are granitoid, gneissic, and schistose. The rocks of the lower belt are tertiary or cretaceous, and contain no metals, except the earthy ores of iron and manganese. The metamorphic rocks associated with granitic occupy the midland counties in part, and the extreme western border, and contain the most important repositories of the ores. The granite formations compose two continuous belts, which traverse the state in a N. E. and S. W. direction. Raleigh is situated on the easterly belt, which is from 20 to 25 m. wide. The granite in this belt is generally light gray, and composed of quartz, feldspar, and a small quantity of mica, feldspar prevailing. It furnishes very good building stone, but no metallic veins. The western belt is from 10 to 14 m. wide, and differs from the eastern by hornblende taking the place of mica. The rock is frequently soft and entirely decomposed, but portions of it contain good building material, and unlike the eastern belt it is traversed by numerous metallic veins and trap dikes. Here are gold mines, some of which produce copper. Buhrstone of good quality abounds in the midland counties, particularly in Montgomery. Agalmatolite, known as the figure stone of the Chinese, is found on Deep river, also near Troy, Montgomery co., and in some other places. Gold is extensively distributed through the hilly and mountainous portions of the state, and belongs chiefly to four geological positions, viz. : loose quartz grits beneath the surface soil; stratified layers contemporaneous with the rock; in connection with seams and joints of the rocks; and in regular veins, associated with quartz and the sulphurets of iron and copper. The gold-mining business has been carried on to a considerable extent in the state for nearly half a century, the regular veins proving the most productive and permanent; the most celebrated of these are the Gold Hill mines in Rowan co., which were discovered in 1842. Other regular veins have been worked in Davidson, Cabarrus, Stanley, Montgomery, and Mecklenburg cos.
Irregular veins and surface gold are also found in the same counties to some extent, and in Catawba, Randolph, Union, and Franklin cos. Many remarkable specimens were found in the vicinity of the Reed mine in Cabarrus co. long before the vein was opened, one weighing 2S lbs. Gold is also found in Anson, Burke, Clay, Cleaveland, Gaston, Guilford, Jackson, Lincoln, McDowell, Moo.v, Nash, Polk, and Yancey cos. Many of the mines that were once productive have been abandoned. The principal counties producing gold are Mecklenburg, Lincoln, Montgomery, and Rowan. There was formerly a branch of the United States mint at Charlotte in Mecklenburg co. It is now an assay office. (See Charlotte.) The whole amount of gold from North Carolina deposited at the United States mint and assay offices to June 30, 1874, was valued at $10,090,656; silver, $44,628; total, $10,135,284. Silver and lead are associated in their ores in this state. Silver is found in Davidson and Clay cos., but the mines have been little worked. Copper is found in Guilford, Clay, Davidson, Jackson, and Mecklenburg cos. Iron is found on Deep and Dan rivers, and in other parts of the state; the ores embrace the hematites, and the specular and magnetic ores. There are mines in Clay and Yancey cos.
Lead is found in Davidson co., copperas in Yancey, and black lead in Wake, Stokes, Yadkin, Yancey, etc. In Davidson co. is an important zinc mine, containing also gold and silver quartz. Bituminous and semi-bituminous coal is mined extensively on Deep river in Chatham co.; it is also abundant on the Dan. A belt of beautiful porphyry extends 7 or 8 m. N. E. from Jones Falls. Steatite, or soapstone, is common in the middle region of the state, and is quarried in Moore co. Limestone, grindstone, and whetstone exist in the "W. part of the state. Alum and copperas slates are found in Cleaveland and Rutherford cos. One of the most extensive deposits in the United States of corundum containing emery occurs in North Carolina; the beds lie on the N". W. side of the Blue Ridge, chiefly in Mitchell co. and the neighboring region. (See Emery.) Extensive mica mines were discovered in Mitchell co. in 1867, and have since been worked with great profit; there are also mines in the adjoining county of Yancey. In the western section mineral springs (sulphur, chalybeate, and alum) abound, and have become places of public resort. Among the curiosities of the state are the Swannanoa gap, a deep pass in the mountains between Morgantown and Asheville; the Catawba Falls near by; the warm springs, Tainted rock, and a curious rock called " the Chimneys," all in Buncombe co.; and the Gingercake rock in Burke co., a curious pile of stone on a rocky eminence, in the form of an inverted pyramid, commanding a fine view of a ravine from 800 to 1,200 ft. deep. Recent freshets in the Catawba, the Yadkin, and the Dan have exhumed from the " bottoms " relics of curious interest, skeletons, burial urns, various implements and utensils of stone, pottery, and copper, and weapons and personal ornaments. In different parts of the mountain regions are ancient mines of unknown date and origin. The most important one is in Cherokee co., and consists of a vertical shaft 100 ft, deep, lined with skilfully worked timber, with a tunnel extending in to meet it from the foot of the hill. These mines are supposed to be of Spanish origin. - The climate of the state is as varied as its surface and products. In the low country the atmosphere is warm and humid, and in the mountainous region it is cool and dry. In the interior it partakes somewhat of each extreme, according to locality. The mean annual temperature at Raleigh, lat. 35° 47', is 60°. At Asheville, Buncombe co., lat. 35° 35', lon. 82° 30', the mean temperature of spring is 53'1°, summer 71.7°, autumn 54.8°, winter 38.2°, year 54.45°; the rainfall in spring is 14.05 inches, summer 16.7, autumn 6.5, winter 8.4, year 45.65. - The soil of North Carolina differs greatly in different parts of the state. In the coast region the swamp lands when drained and the river bottoms are fertile, and rice grows well. The pine region is barren for the most part, while further inland the soil improves, and is well adapted to wheat, rye, barley, oats, and flax. Cotton is chiefly raised in the counties along the S. border. The western and mountainous portion of the state is best adapted to grazing. Among the chief products are sweet potatoes (of which North Carolina produced more in 1870 than any other state), tobacco, and Indian corn. The forest trees of the upland are oak, hickory, ash, walnut, and lime; in the low country, pine; and in the swamps, cedar, cypress, maple, oak, poplar, with an undergrowth of vines. Among the fruits are apples, pears, peaches, plums, cherries, grapes, and strawberries. Grapes are abundant in the coast region. The scupper-nong, which is a native of and peculiar to North Carolina, has attracted attention for its large size, luscious flavor, and excellent wine-making qualities. Cranberries are produced in abundance, and are exported. The ginseng, wild ginger, snakeroot, hellebore, spikenard, and other medicinal herbs are exported to the value of about $250,000 annually. In Albemarle and Pamlico sounds immense quantities of herring and shad in season are taken. The estuaries and bays are favorite resorts of wild fowl of every species. In the forest country in the eastern part of the state, quail, partridges, and other game birds abound; while in the mountainous region of the western portion deer are plenty, and bears and other wild animals are found. - In 1870 the state contained 5,258,742 acres of improved land, 12,026,894 of woodland, and 2.549,774 of other unimproved land. The total number of farms was 93,565; average size, 212 acres. There were 6,744 containing from 3 to 10 acres, 14,257 from 10 to 20, 35,280 from 20 to 50, 22,167 from 50 to 100, 13,819 from 100 to 500, 889 from 500 to 1,000, and 116 of 1,000 and over. The cash value of farms was $78,211,083; of farming implements and machinery, $4,082,111; total amount of wages paid during the year, including value of board, $8,342,856; total (estimated) value of all farm productions, including betterments and additions to stock, $57,-845,940; orchard products, $394,749; produce of market gardens, $48,499; forest products, $1,089,145; home manufactures, $1,603,513; value of animals slaughtered or sold for slaughter, $7,983,132; of all live stock, $21,993,967. There were 102,763 horses, 50,684 mules and asses, 196,731 milch cows, 45,408 working oxen, 279,023 other cattle, 463,435 sheep, and 1,075,-215 swine. The productions were 405,238 bushels of spring and 2,454,641 of winter wheat, 352,006 of rye, 18,454,215 of Indian corn, 3,220,105 of oats, 3,186 of barley, 20,109 of buckwheat, 532,749 of peas and beans, 738,803 of Irish and 3,071,840 of sweet potatoes, 83,540 tons of hay, 144,935 bales of cotton, 2,059,281 lbs. of rice, 11,150,087 of tobacco, 799,667 of wool, 4,297,834 of butter, 75,185 of cheese, 59,552 of flax, 21,257 of maple sugar, 1,404,040 of honey, 109,054 of wax, 35 hogsheads of cane sugar, 62,348 gallons of wine, and 33,888 of cane, 621,855 of sorghum, and 418 of maple molasses. - The most important branch of manufacturing is that of spirits of turpentine, which is produced by distillation from crude turpentine, or the sap of a long-leaved pine (pinus palustris). There is an immense extent of territory in North Carolina covered by this species of pine, extending from a point near the line of Virginia across the entire state, and indeed beyond the state to the gulf of Mexico, and varying in width from 30 to 80 m.
This belt of land is between the swampy country along the coast and the hilly region of the interior, and consists mainly of a level, sandy barren. Although the "piney woods," as the natives call the turpentine forests, have been settled by Anglo-Saxons about as long as any portion of the United States, yet the roads are very poor, being the merest openings through the woods, and generally without bridges across the streams. The pine trees which cover this tract are from 8 to 18 in. in diameter, with straight trunks which run up 25 to 30 ft. without a limb, at which height their evergreen foliage forms a canopy so dense as to nearly shut out the light of the sky. (See Turpentine.) According to the census of 1870, there were 147 establishments engaged in the production of tar and turpentine, with a capital of $472,100. The products of that year were valued at $2,338,309, and included 456.-131 barrels of rosin, valued at $861,222; 300 of tar, worth $820; and 3,799,449 of turpentine, valued at $1,428,567. North Carolina is the great seat of this industry in the United States. The entire products of the latter in 1870 were valued at $3,585,225. Of the 6,784,173 gallons of spirits of turpentine, valued at $2,-753 933, exported from the United States during the year ending June 30, 1874, 4,532,388 gallons, worth $1,793,244, were exported directly from North Carolina. A large portion of the rosin and turpentine exported from the United States is also from North Carolina ports, chiefly Wilmington. During the same year the shipments of rosin and turpentine amounted to 426.395 barrels, valued at $1,159,022; tar and pitch, 17,660 barrels, worth $42,824. Miles in operation in N. C in 1874. Total length of line when different from preceding. The Dismal Swamp canal, lying in North Carolina and Virginia, affords communication between Albemarle sound and Chesapeake bay. Important improvements have been made by the Roanoke navigation company in the Roanoke, Dan, and Staunton rivers. A part of these is the Weldon canal, 12 m. long. Improvements in Cape Fear and Deep rivers are also owned by companies. At the beginning of 1875 there were 11 national banks in operation, with a paid-in capital of $2,200,000; circulation issued, $2,130,320; outstanding, $1,-824,545. The latter amount was $1 70 per capita of the population; ratio of circulation to the wealth of the state, 7 per cent. ; to bank capital, 82.9 per cent. - The government is administered under the constitution adopted in 1868, which declares that the state shall ever remain a member of the American Union, and that there is no right on the part of the state to secede therefrom; that every citizen owes paramount allegiance to the constitution and government of the United States; that the state shall never assume or pay any debt incurred in aid of insurrection or rebellion against the United States, or any claim for the loss or emancipation of any slave; that slavery and involuntary servitude, otherwise than for crime whereof the parties shall have been duly convicted, shall be and are for ever prohibited; and that no property qualification shall be required as a condition of voting or holding office. The legislative power is vested in a general assembly consisting of a senate of 50 and a house of representatives of 120 members, who are elected by the people for two years. The sessions are biennial, beginning on the third Monday of November in even years. In and after 1876 the state election will be held on the Tuesday after the first Monday in November. The president of the senate and speaker of the house receive each $7 a day during the session of the legislature, and 20 cents for each mile travelled in going to and returning from the capital. Members receive $5 a day and mileage. The executive officers are elected for a term of four years, and are as follows: governor, salary $4,000; lieutenant governor, who is president of the senate; secretary of state, $1,000 and fees; auditor, $1,250 and fees; treasurer, $3,000; superintendent of public instruction, $1,500; attorney general, $1,500 and fees. The governor may grant reprieves and pardons after conviction, but has no veto. The executive officers enter upon their duties on the first day of January succeeding their election. The governor and lieutenant governor are ineligible for two successive terms. The secretary of state, auditor, treasurer, and superintendent of public instruction constitute the council of state, which advises the governor in the execution of his duties. The judicial power is vested in a supreme court consisting of a chief justice and four associate justices, a superior court with one judge in each of the 12 judicial districts into which the state is divided, and courts of justices of the peace. The supreme court has in general only appellate jurisdiction; the superior courts have general original jurisdiction both civil and criminal, and hear appeals from justices of the peace and probate judges; justices of the peace have jurisdiction in civil cases wherein the amount involved does not exceed $200, provided the title to real estate does not come in question, and of criminal proceedings for minor offences. The clerks of the superior courts act in most matters as probate judges. The judges of the supreme and superior courts are elected by the people for eight years, and receive a salary of $2,500 each. The elective franchise is conferred upon every male citizen of the United States, 21 years of age and upward, who shall have resided in the state one year next preceding the election, and 30 days in the county in which he offers to vote. Bonds commonly called "specoal tax"
Assessed Value of real estate. In 1874 the total property of the state was reported by the auditor at $143,723,813, including land valued at $76,959,193; town property, $16,652,131; horses, mules, cattle, etc, $18,214,692; fanning utensils, money on hand or deposit, solvent credits, etc, $31,897,797. The North Carolina institution for the deaf and dumb and the blind, in Raleigh, receives an annual appropriation from the state of about $40,000. There is an excellent department for colored persons. In 1874 there were 13 instructors, 138 deaf and dumb pupils, including 50 colored, and 77 blind, of whom 14 were colored. The state insane asylum in Raleigh was opened in 1856, and to Nov. 1, 1874, had received 1,087 patients, of whom 247 remained in the asylum at that date. Of those discharged, 275 were cured, 103 improved, 172 unimproved, and 290 died. In 1874 the state contained upward of 600 insane not in any asylum. The capacity of the asylum (245 inmates) is greatly inadequate to the needs of the state. The state penitentiary is also in Raleigh, and contained on Nov. 1, 1874, 445 convicts. They are employed in making brick, clothes, and shoes, but the institution is not self-sustaining. - A fund for the support of common schools was provided for by the legislature in 1825; in 1836 $1,433,757 was received as a deposit from the general government, and in 1840 the common school system went into operation. In the latter year the general assembly provided for the apportionment of the income of the common school fund, the principal of which amounted to about $2,000,000, among the several counties according to the white population. The public schools were suspended in 1865 through loss of school funds, and remained closed till about 1870. The constitution of 1868 requires the general assembly to provide for a uniform system of free public schools for all children between 6 and 21 years of age. Each county must be divided into districts in which one or more public schools shall be maintained at least four months in every year; and if the county commissioners fail to comply with this provision, they shall be liable to indictment. The general assembly is empowered to enact that every child of sufficient mental and physical ability shall attend the public schools, during the period between the ages of 6 and 18 years, not less than 16 months, unless educated by other means. The constitution provides for a permanent school fund, and appropriates 75 per cent, of the entire state and county capitation tax to the maintenance of free public schools. Their general supervision is vested in a state superintendent of public instruction, who is elected by the people for four years. County commissioners have control of the public schools in the county, and a school committee of three is elected biennially in each township. The state hoard of education comprises the governor as president, the superintendent ot public instruction as secretary, the secretary of state, treasurer,.auditor, and attornev general. The permanent school fund in 1874 was $2,190,564. The entire revenue for school purposes amounts to about $300,000 a year. Whenever this is insufficient to maintain the public schools four months a year in each district in any county, provision is made for the levy of a county tax with the approval of the voters of the county. Substantial aid is also derived from the Peabody educational fund. No distinction is made between white and colored children in the apportionment of school funds, but separate schools are provided. During the year ending June 30, 1873, there were in the state 348,603 children between the ages of 6 and 21 years, of whom 114,852 were colored. Of the whole number, 146,737, including 40,428 colored, attended the public schools an average of 2½ months. The daily average was: white, 70,872; colored, 26,958; total, 97,830. There were 2,565 public schools for white and 746 for colored children. According to the census of 1870, the whole number of persons between the ages of 5 and 18 years was 359,930, of whom 135,845 were colored. The number attending school was 65,301, of whom 11,419 were colored. The number of schools of all classes was 2,161, having 1,739 male and 953 female teachers, and 32,664 male and 32,294 female pupils. The total income for the year ending June 1, 1870, was $635,892, being $9,160 from endowment, $232,104 from taxation and public funds, and $394,628 from other sources, including tuition. North Carolina has no state normal schools; but the Ellen-dale teachers' institute at Ellendale Springs, and the Williston academy and normal school in Wilmington, afford professional instruction to teachers. - The university of North Carolina, chartered in 1789, is at Chapel Hill, 28 m. W. of Raleigh, where it has valuable property and a library containing about 25,000 volumes. Its alumni number upward of 1,700. Since 1871 the institution has been suspended for financial reasons. In 1873 a constitutional amendment was adopted providing for its reorganization. Trinity college, at Trinity, about 100 m. W. of Raleigh, is under the control of the Methodist Episcopal church, South, but is not sectarian. The system of instruction comprises 13 courses, viz. : Latin, Greek, mathematics, English literature, natural science, mental and moral philosophy, modern languages, theology, engineering and architecture, analytical chemistry, and law. Theology or law may be studied exclusively; of the other courses the student may take any three. In 1873-'4 there were 6 instructors and 122 students, of whom 71 were pursuing academic, 13 theological, 16 law, 23 scientific, and 18 preparatory studies. The library contained 9,000 volumes. Davidson college (Presbyterian), at Davidson, Mecklenburg co., 23 m. N. of Charlotte, was organized in 1837, and in 1873-4 had 7 instructors and 117 students. There is a classical course of four and a scientific course of three years, besides an eclectic course. The institution has a library of 7,000 volumes, and valuable cabinets and apparatus. North Carolina college (Lutheran), at Mt. Pleasant, organized in 1859, has collegiate, preparatory, and theological departments. In 1873-'4 there were 6 instructors and a total of 115 students. Wake Forest college (Baptist), at Forestville, Wake co., has preparatory, collegiate, and commercial departments. In 1873-4 there were in all departments 7 instructors and 80 pupils. Raleigh, having received from Queen Elizabeth a grant for such lands as he might discover in America, "not possessed by any Christian people," sent out two small vessels, which made the land at Cape Fear, coasted north for a harbor, and finally, early in July, ran into Ocracoke inlet, and landed on an island called by the natives Wococon, where they were hospitably received. After slight explorations they bestowed the name of Virginia upon the region, and returned to England with a highly favorable account of the country, which induced the expedition of 1585. Other colonists were sent out by Raleigh the same year, and the year following, who are supposed to have fallen victims to the Indians; and no further attempts were made to colonize the country till about the middle of the 17th century. In 1663 Charles II. formed the province of Carolina, which he granted to eight noblemen. This grant was bounded S. by lat. 29°, W. by the Pacific ocean, N. by lat. 36° 30', and E. by the Atlantic. The grantees were made joint proprietors and vested with jurisdiction over the colonists. Previous to this grant a few settlements had been made in the N. part of the province, near Albemarle sound, by dissenters from Virginia, and a little colony had been planted near the mouth of Cape Fear river by New Englanders, which was subsequently abandoned. The philosopher John Locke wrote a scheme of government for the whole province, which was nominally its fundamental law for about 25 years, but which was so complicated and cumbersome as never to be completely carried out. Albemarle, the name then given to what now constitutes North Carolina, was augmented by settlement from Virginia, New England, and Bermuda. In 1674 the population was about 4,000, and the annual product of tobacco 800,000 lbs. Thomas Cary was appointed governor in 1705, but was removed to give place to Edward Hyde; whereupon Cary, to retain his position, incited a rebellion, and at the head of an armed force attacked Edenton, but was repulsed, and finally, by the aid of regular troops from Virginia (1711), the rebellion was suppressed. Meanwhile the province was involved in a war with the savages. The Tuscaroras began a war of extermination; but by the assistance of neighboring colonies this tribe was subdued (1713), and finally emigrated to the north. Other hostile tribes were also reduced to subjection. In 1717 the number of taxable inhabitants did not exceed 2,000, having gained no more than 600 since 1676. In July, 1729, during the administration of Gov. Everard, Carolina became a royal government, the king having purchased from the proprietors seven eighths of their domain; the remaining eighth was retained by Lord Carteret, who surrendered his right of jurisdiction, but not of soil. North and South Carolina now became district provinces. In 1765 North Carolina had gained considerable accessions to its population from a colony of Presbyterians from the north of Ireland, who settled in the N. W. part of the state, a party of Moravians who settled between the Yadkin and Dan rivers, and a party of highlanders who located near Fayette-ville. In 1701) the assembly declared against the right of Britain to tax North Carolina while unrepresented in parliament, and was accordingly dissolved by Gov. Tryon. North Carolina sent representatives to the first continental congress, September, 1774, and united in adopting the declaration of colonial rights. An association for the defence of those rights was formed in Mecklenburg co., which in May, 1775, formally renounced allegiance to the crown, and published a declaration of independence; but this feeling was not general, and counter-combinations were formed to sustain the royal authority. Alarmed at the threatening state of affairs, Gov. Martin retired on board a man-of-war in Cape Fear river, July 17, 1775. A convention was held, Aug. 20, which authorized the raising of three regiments of troops, which were subsequently increased to five, and taken into pay by congress. A proclamation was issued by Gov. Martin from on board ship forbidding their meeting, which the convention denounced as scandalous and scurrilous, and ordered it to be burned by the hangman. The loyalists were quite strong, especially among the "regulators" and highlanders. A body of 1,500 loyalists, under McDonald and McLeod, who had been commissioned by Martin, attempted to reach the coast and join Gen. Clinton, but were met by the patriots under Caswell and Moore, and routed with the loss of McLeod and 850 prisoners, including McDonald. In April, 1776, the North Carolina convention authorized their delegates to unite with the other colonies in a declaration of independence. North Carolina ordered four more regiments to be raised, and the loyal highlanders and regulators to be disarmed. In December, 1776, the province adopted a state constitution, and elected Richard Caswell as governor. The colony furnished her quota of men, but, beyond the partisan warfare between the patriots and loyalists, was not the scene of important military operations till 1780. The battle of Guilford Court House, fought March 15, 1781, between (Jen. Greene and Cornwallis, was the chief event of the war within this state. The constitution of the United States, formed in 1787, was rejected by North Carolina in 1788, but finally adopted in 1789. - The popular sentiment in North Carolina at the beginning of 1861 was in favor of the Union, and at an election held Feb. 28 the people voted by a small majority not to call a convention for considering the question of secession. "But after the attack on Fort Sumter, Gov. Ellis raised troops, seized Forts Caswell and Johnson, which formed the defences of Wilmington, and Fort Macon in the harbor of Beaufort, and took possession of the mint at Charlotte and the arsenal at Fayetteville. A convention having been called by the legislature, which had convened in extra session on May 1, an election of delegates was held on May 13, and on the 20th, the 86th anniversary of the Mecklenburg declaration of independence, the convention assembled in Raleigh. On the following day the ordinance of secession was passed and the confederate constitution was ratified. These measures were not submitted to the people. Delegates were also chosen to the confederate congress. On Aug. 29, 1861, an expedition under Commodore S. H. String-ham and Gen. B. F. Butler, consisting of three 50-gun frigates with four smaller vessels and two steam transports, carrying 800 soldiers, captured Forts Hatteras and Clark, which commanded the entrance to Pamlico sound. On Feb. 8, 1862, an expedition under Commodore Golds-borough and Gen. Burnside, consisting of more than 100 vessels and 11,500 troops, captured Roanoke island, with 6 forts, 40 guns, and 2,000 prisoners; and thence operations were directed against other important points. Before the close of the month, Elizabeth City, Edenton, and Winton were taken. New Berne was captured on March 14, and Morehead City and Beaufort were next occupied without resistance. Fort Macon, guarding Beaufort harbor, surrendered on April 26 after a bombardment, and Washington, Plymouth, and other towns on the coast were occupied by the Union forces. Plymouth was recaptured by the confederates in April, 1864, with 1,600 men and 25 guns, but was recovered by the Unionists on Oct. 31. Wilmington, a favorite resort of the blockade runners, was the next point of attack. In 15 months (October, 1863, to December, 1864) 397 vessels ran the blockade at this port; the amount of cotton exported from January, 1863, to October, 1864, was 137,937 bales; and the export and import trade during the year ending June 30, 1864, was $65,185,-000. Fort Fisher, the chief defence of the city, was bombarded by Admiral Porter, Dec. 24, 1864, but the land forces under Gen. Butler being unable to cooperate, the attack failed. Another attempt by Porter and Gen. Terry, Jan. 15, 1865, resulted in the surrender of the fort and the other defences of Cape Fear river. Wilmington was taken by Gen. Schofield, Feb. 22, and Goldsboro on March 21, Kingston having been occupied on the 14th. At Goldsboro Schofield was soon joined by the army of Gen. Sherman, which had defeated the confederates under Hardee at Averysboro and those under J. E. Johnston at Bentonville. Raleigh was occupied on April 13, and on the 26th hostilities were ended by the surrender of Gen. Johnston's army. On May 29, 1865, President Johnson appointed W. W. Ilolden provisional governor. Delegates to a convention were elected on Sept. 12, and having assembled in Raleigh, Oct. 2, adopted resolutions declaring the ordinance of secession null, abolishing slavery, and repudiating the state debt created in aid of the rebellion. An election for governor and members of congress and the state legislature was held on Nov. 9, when also the resolution declaring the secession ordinance void, and that abolishing slavery, were ratified by the people. The legislature assembled on Nov. 13, and subsequently ratified, with six dissenting voices, the amendment to the federal constitution abolishing slavery. On Dec. 23 the provisional governor was succeeded by the newly elected governor Worth. According to adjournment, the convention reassembled on May 24, 1866, and adopted amendments to the constitution, which were rejected by the people at an election held Aug. 2. The government of North Carolina as thus reorganized did not meet the approval of congress, nor were the representatives of the state admitted to that body. Pursuant to the reconstruction act of congress, passed March 2, 1867, providing a military government for the southern states, North and South Carolina were constituted the second military district, under command of Gen. D. E. Sickles, who was instructed to take the necessary measures for assembling a convention to reorganize the state government. Gen. Sickles entered upon his duties on March 21, with his headquarters in Columbia, S. C, but was superseded by Gen. Canby, who assumed command on Sept. 5. A registration of those persons qualified to vote under the reconstruction acts of congress was begun in August and completed before the middle of October, when 103,060 white and 71,657 colored voters had been registered. The election was held on Nov. 19 and 20, when a vote was taken on the question of "convention" or "no convention," and also for delegates to the convention in case of holding one. The total number of votes cast was about 130,000, of which 60,000 were those of colored persons; about 90,000 votes were cast for the convention. That body having assembled on Jan. 14, 1868, the present constitution was framed; and it was ratified by the people on April 21-23. The whole number of votes registered was 196,876, of whom 117,431 were white and 79,445 colored; 93,118 votes were cast in favor of the constitution, and 74,009 against it. At the same election state officers, members of the legislature, and representatives to congress were chosen. The new constitution having been approved by congress, a law was passed, June 25, 1868, entitling North Carolina with other states to representation in congress upon the ratification by their legislatures of the fourteenth amendment to the federal constitution. The legislature assembled on July 1, and on the following day ratified the amendment. On the 4th Gov. Holden was formally inaugurated, and on the 11th a proclamation was issued by the president announcing that North Carolina had complied with the condition prescribed by congress for her restoration to the Union. The fifteenth amendment to the federal constitution was ratified March 4,1869, by a vote of 40 to 8 in the senate and 87 to 20 in the house. During 1869 and 1870 the peace of the state was seriously disturbed by outrages alleged to have been committed by masked outlaws belonging to a secret organization known as the Ku-Klux Klan. On March 7 Gov. Holden declared martial law in Alamance county, and subsequently in Caswell county, which continued in both counties until Nov. 10. For these acts articles of impeachment were preferred against him on Dec. 14, which resulted in his conviction and removal from office.